A good watch is like a chess game with a grandmaster. You may play a Sicilian defence and feel secure behind your pawns but then an unexpected Yugoslav attack takes up your centre and chews up your lines. You marvel at your loss and realize, as much as you know about the game, as much as it seems simple and straightforward, there can be such dexterity and ingenuity beneath the façade. 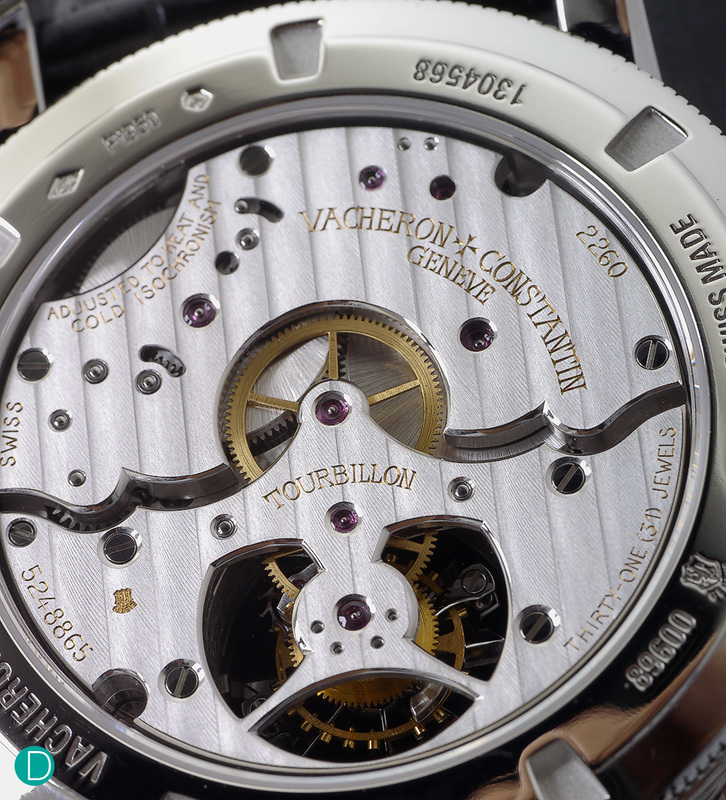 That is exactly how we feel about the Platinum Vacheron Constantin Patrimony Traditionnelle 14-Day Tourbillon. It may look simple on the outside, but when you truly encounter it, you will realise how frighteningly good it can be. Cased in Platinum, this particular model 89600/000P-9878 has its bezel and lugs lined with baguette cut diamonds. The front of the watch showcases a Slate-Coloured Opaline dial with power reserve at 12 o’clock and a tourbillon cage at 6. 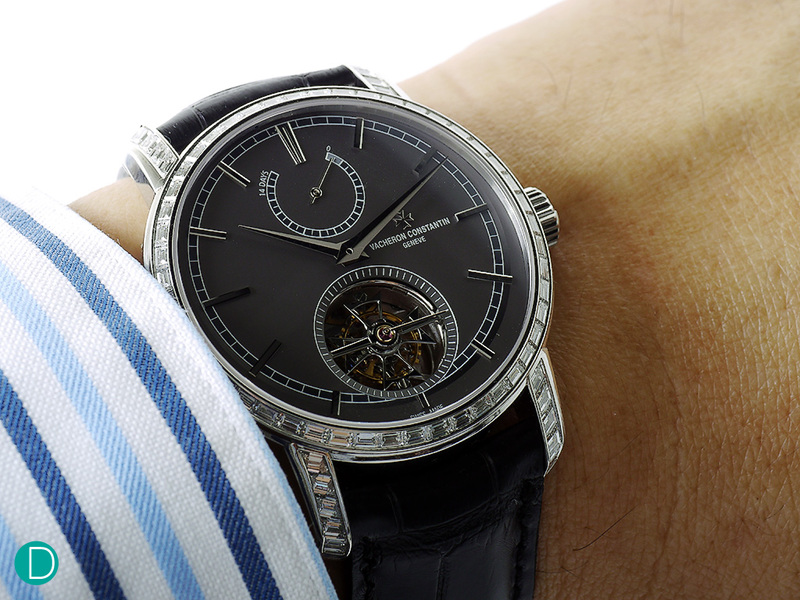 Immediately recognisable is the dauphine hands, representative of Vacheron’s traditionnelle collection. 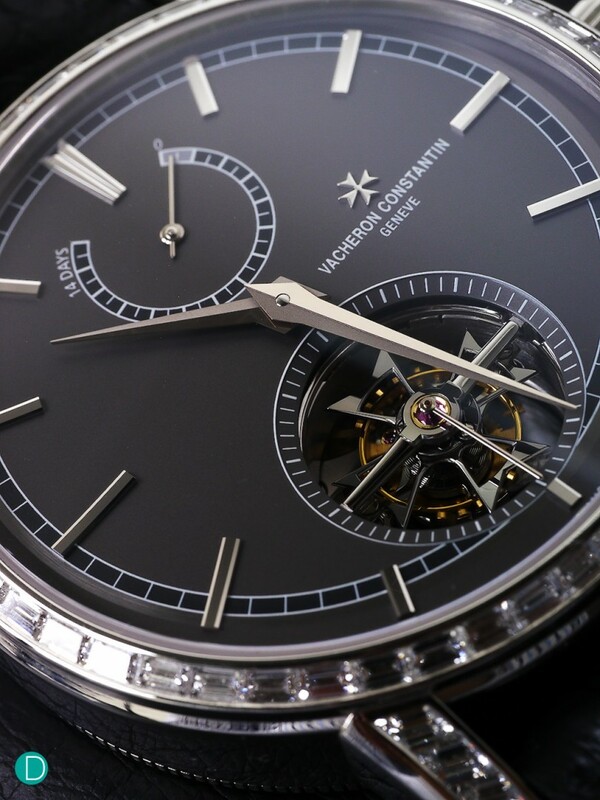 The symmetry of the dial lends congruity and coherence to the design. A better look at the tourbillon cage, featuring a black finish Maltese cross, and rounded arms. This tourbillon cage is a real work of art. It features the highly iconic Maltese cross that showcases the highest levels of finishing. The anglage on the cross tapers and curves with such fluidity, while still being identical at all four quarters. Looking through the caseback. A breathtaking moment. Completely hand finished, the movement is decorated with utmost artisanship. The sketch-like quality of the hand engraved Côtes de Genève lines compliments the wavy anglage surrounding the two bridge plates. Sharp inward and outward angles further enhance the beauty of the beveled edges. Most noticeable is the ‘U-shape’ cut out at the tourbillon cage, which helps to show another dimension of the tourbillon from the movement side. So much attention is given to the finishing that even the screws are polished and beveled in black polished countersinks. The Tourbillon on the wrist. To the layman, the watch is simple and “nothing special”, but to the real connoisseur, the Tourbillon is nothing short of a masterpiece. 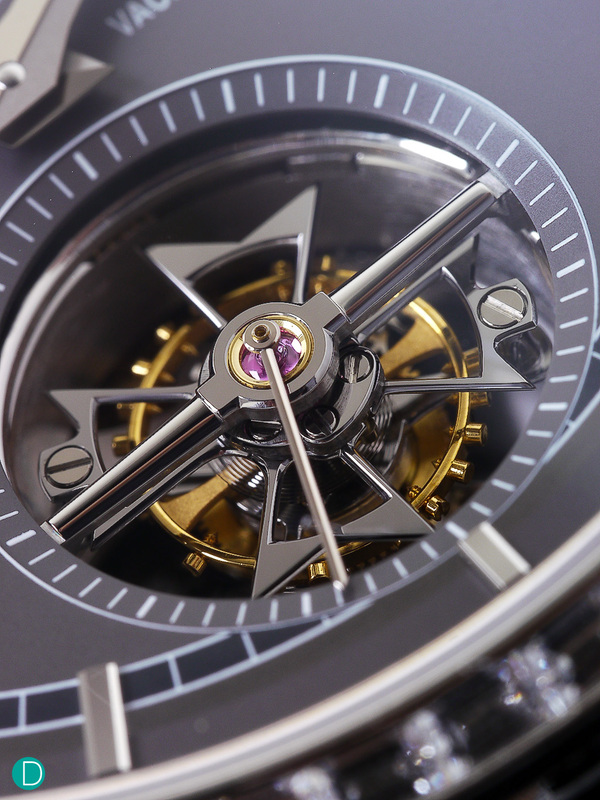 It beats at a stately 2.5Hz (18,000 vph), rotating the seconds hand and the Maltese cross as it moves. Moreover, it is also certified with the Geneva Hallmark, a sign of excellence and great craftsmanship.